Endocrine myopathy is a less recognized and often overlooked entity in clinical practice. Endocrine diseases are generally associated with hormonally-mediated systemic alterations in muscle metabolism. Even though most of the endocrine disorders are associated with muscular dysfunction, it is rarely a presenting complaint and the significance of this entity lies in total reversal of myopathy on treatment of the primary underlying condition. Herein, we discuss endocrine myopathy in three of our patients, who were referred to the endocrinologist, and then, we discuss in detail about this association. A 40-year-old female patient attended the medical outpatient department (OPD) with a history of weight loss and myalgia for the past 2 months. These complaints were gradually progressive in nature and the patient is now unable to get up from squatting position and has additional difficulty in standing up from a chair. She denied any history of paresthesia, bowel or bladder disturbances, or symptoms suggestive of cranial nerve involvement. The patient kept losing weight even with an increased appetite. Her past medical history was not significant and her menstrual cycles were regular. Examination revealed grade 2 goiter with audible bruit without any features of infiltrative orbitopathy and her blood pressure was 130/100 mm Hg; her pulse rate was 108 beats/min. Central nervous system examination revealed 3/5 power in proximal group of muscles in lower limbs and normal power in distal group of muscles. Power in all muscle groups in the upper limb was normal. The rest of the nervous system examination including reflexes and the sensory system were normal. Other system examinations including the heart, lungs, and gastrointestinal system were normal. Hemoglobin 9.6 g% (11-15), total leukocyte count 6,800/mm 3 (4-11,000), erythrocyte sedimentation rate (ESR) 30 (9-14), fasting blood sugar (FBS) 90 mg% (80-110), serum (sr.) creatinine 1.2 mg/dL (0.8-1.4), corrected sr. calcium 9.4 mg/dL (8.4-10.4), creatine phosphokinase (CPK) - 180 IU/mL (<192), T 3 8.12 ng/mL (0.8-1.2), T 4 26 mcg/dL (5-12), thyroid-stimulating hormone (TSH) 0.01 miU/mL (0.3-5.5). 99 Technetium thyroid uptake scan showed diffusely increased uptake in both glands suggestive of Graves' disease. She was referred to an endocrinologist for the management of Graves' disease. She was started on carbimazole 30 mg/day along with propranolol 40 mg/day. Her symptoms improved after 6 weeks of treatment. She gained a weight of 6 kg and her muscle weakness improved along with normalization of the thyroid profile at the end of 3 months. At present the patient is on regular follow-up with a maintenance dose of carbimazole 20 mg/day. A 22-year-old female presented to the Department of Orthopedics with complaints of generalized body pains for 1 year and difficulty in walking since the past 6 months. She was apparently asymptomatic till 1 year ago, when she initially developed body pains that were gradually progressive in nature, associated with difficulty in getting up from the squatting position and in reaching for objects above the shoulder height, followed by difficulty in climbing stairs; eventually, the patient became chairbound. She denied any history of paresthesia, bowel or bladder disturbances, or any history of fractures or renal calculi in the past. On examination, her vitals were normal, with blood pressure of 110/80 mm Hg. Central nervous system examination revealed 3/5 power in proximal group of muscles in both upper and lower limbs and 4/5 power in the distal group of muscles, which was associated with severe body pains. Rest of the nervous system examinations and other system examinations including the heart, lungs, and the gastrointestinal system were normal. Routine biochemistry including thyroid profile were normal, CPK - 198 IU/mL (<192), sr. calcium 11.6 mg/dL (8.4-10.4), phosphorus 2.3 mg/dL (2.5-4.6), albumin 4.0 gm/dL (3.5-5.0), alkaline phosphatase 1023 IU/L (32-91), 25-hydroxy (OH) vitamin D 28.1 ng/mL (30-100), intact-parathyroid hormone (iPTH) 625 pg/mL (11-66). 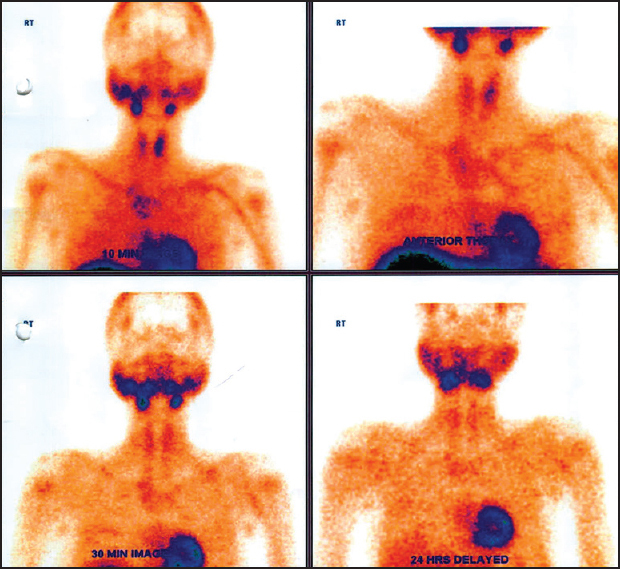 As these reports were suggestive of hyperparathyroidism, the patient was referred to endocrinology. 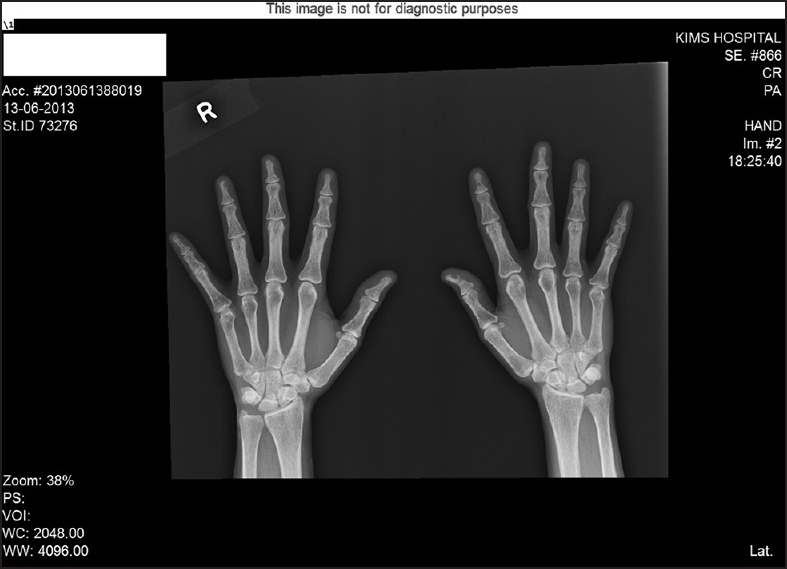 Further investigations: X-ray revealed periosteal resorption of metacarpals and diffuse osteopenia at pelvic bones [Figure 1] and [Figure 2]. Sestamibi scan showed ectopic parathyroid in the suprasternal area [Figure 3] and computed tomography (CT) scan confirmed it. The patient underwent excision of the lesion. iPTH was 330.8 pg/mL 1 h after surgery, suggestive of successful removal. In the postoperative state, the patient improved symptomatically with normal calcium (8.8 mg/dL), phosphorus levels (3.8 mg/dL), and she developed hypocalcemia and hypophosphatemia on postoperative day 3 (Hungry bone syndrome), which was managed by intravenous calcium and calcitriol. On postoperative follow-up 6 months later, the patient is doing well and came to the OPD walking, with a corrected sr. calcium of 9.4 mg/dL, phosphorus 3.8 mg/dL, and iPTH of 23 pg/mL. A 56-year-old gentleman presented to the Department of Neurology with complaints of generalized body pains for 2 years and difficulty in walking since the past 1 year. He was apparently asymptomatic 2 years ago; then he initially developed severe myalgia that was intermittent, exacerbated by work, dragging in nature, and relieved by rest. This progressed to difficulty in getting up from the squatting position and in reaching for objects above the shoulder height, followed by difficulty in climbing stairs. These symptoms were progressive and eventually the patient became chairbound. He denied any history of paresthesias, bowel or bladder disturbances, or symptoms suggestive of cranial nerve involvement. Additionally, history was negative for diurnal variation of complaints or fever, rash, joint pains, and weight loss. He has hypertension and hypothyroidism which are well controlled with telmisartan 40 mg and levothyroxine 50 mcg per day. Past history includes fracture of the left femur due to trivial trauma a year ago. On examination, his vitals were normal, with blood pressure of 130/80 mm Hg. Central nervous system examination revealed 2/5 power in proximal group of muscles in both upper and lower limbs and 4/5 power in distal group of muscles, which was associated with severe tenderness in both muscle groups. Rest of the nervous system examinations including reflexes and the sensory system were normal. Other system examinations including the heart, lungs, and the gastrointestinal system were normal. As routine biochemistry thyroid function tests, CPK levels and electroencephalogram (EEG) were normal; the patient was referred to the Department of Endocrinology to rule out any metabolic myopathy. Phosphorus 1.5 mg/dL (2.5-4.6), sr. calcium 8.6 mg/dL (8.4-10.4), albumin 3.8 gm/dL (3.5-5.0), alkaline phosphatase 410 IU/L (32-91), 25 (OH) vitamin D 38.1 ng/mL (30-100), iPTH 114.5 pg/mL. The ratio of phosphorus tubule maximum to glomerular filtration rate (TmP/GFR) was 1 (2.5-4.5), suggestive of hypophosphatemic rickets. 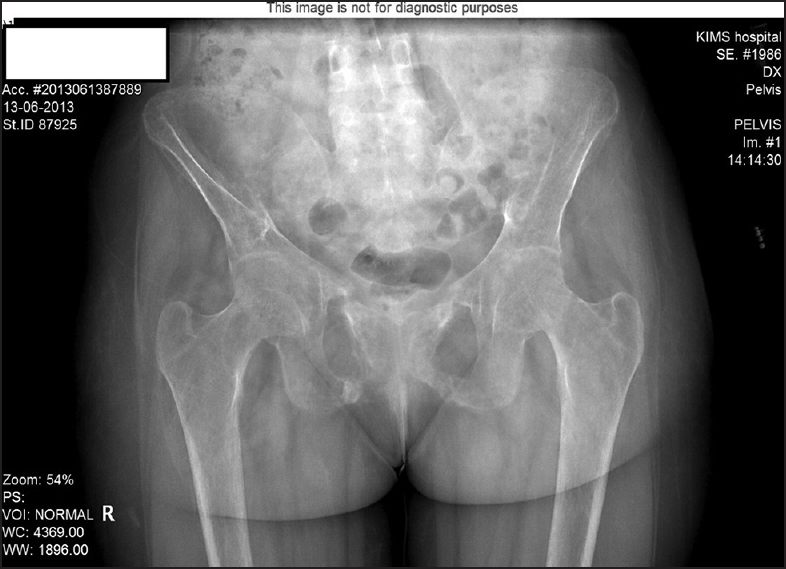 Considering the patient's age and the recent onset of symptoms, tumor-induced osteomalacia (TIO) was suspected. Fibroblast growth factor 23 (FGF-23) levels were 6,600 RU/mL (0-180) and 68 Gallium dotanac positron emission tomography scan ( 68 Ga-dotanoc PET/CT) was positive for an occipitoparietal lesion with soft tissue component [Figure 4]. 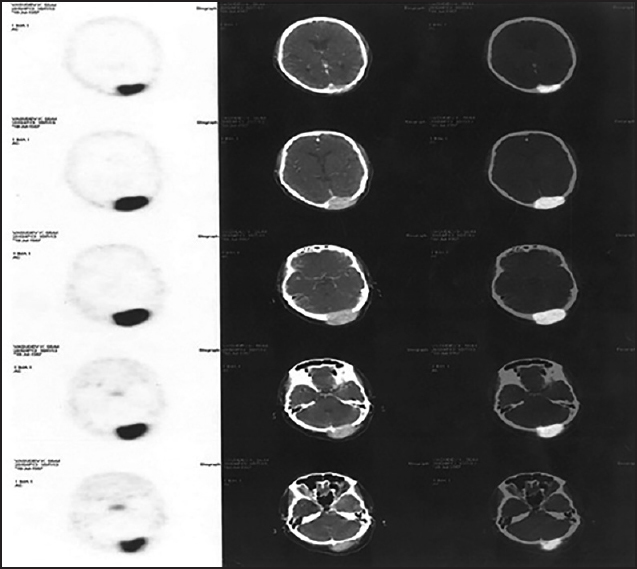 Magnetic resonance imaging (MRI) showed an intracranial extradural soft tissue tumor in the occipitoparietal region. The patient underwent surgery with the removal of tumor and repair of the duramater. 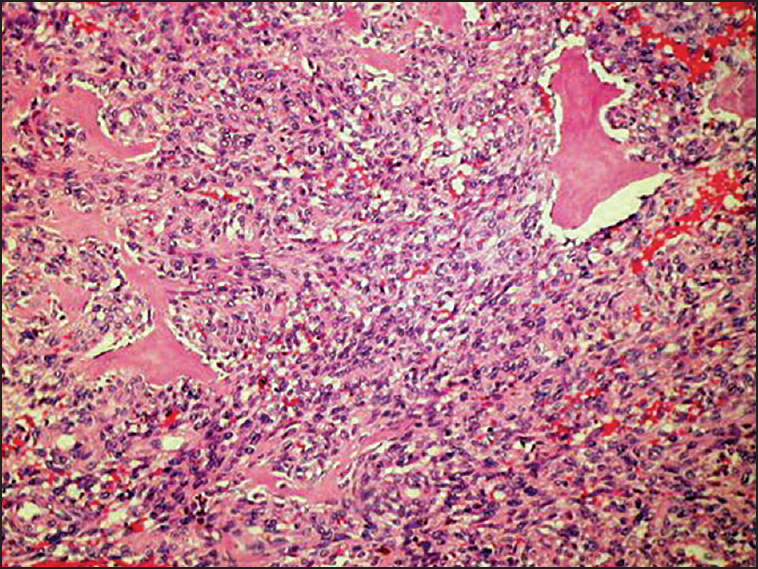 Histopathology of the tumor revealed a phosphaturic mesenchymal tumor [Figure 5]. In the postoperative state the patient improved symptomatically with normal phosphorus levels (3.8 mg/dL), and as expected, he developed hypocalcemia on postoperative day 5, which was managed by intravenous calcium and calcitriol. On postoperative follow-up 2 months later, the patient is doing well and came to the OPD walking, with a corrected sr. calcium of 9.0 mg/dL, phosphorus 3.5 mg/dL, and normal FGF-23 of 24 RU/mL. In the above case reports, we have shown the association of muscle disease with three endocrine disorders namely, hyperthyroidism, hyperparathyroidism, and hypophosphatemic rickets. Myopathy completely reversed on successful treatment of above conditions. Our cases 2 and 3 are remarkable for the fact that the myopathy was accompanied by disorders of the calciotropic hormones. Muscle weakness is common in disorders of calcium and phosphorus homeostasis, including primary and secondary hyperparathyroidism, hypoparathyroidism, and other abnormalities of bone metabolism. The association of myopathy with hyperparathyroidism and osteomalacia was recognized over a century ago, first by Hirschberg in 1889. The myopathy associated with primary hyperparathyroidism or osteomalacia is characterized by a gradual onset of symmetric proximal weakness with atrophy. Pain is often prominent comorbidity, and the combination of weakness and bone or muscle pain may be the presenting complaint in up to 50% of patients with primary hyperparathyroidism. Significant leg weakness leads to a waddling gait or inability to walk in some patients. Cramps and paresthesias are reported in approximately 50% patients. Besides proximal weakness and atrophy, examination of patients with hyperparathyroidism often reveals brisk muscle stretch reflexes with flexor plantar responses. Underlying peripheral neuropathy has been reported as well. In addition, vitamin D deficiency has been associated with muscle symptoms, including myalgias and proximal myopathy. The key pathogenetic mechanism in oncogenic osteomalacia is dysregulation of phosphate metabolism. So, careful history, meticulous examination, and appropriate investigations are needed to make the diagnosis of endocrine myopathies, as these disorders are treatable, thereby, lessening the morbidity to the patient. Sharma V, Borah P, Basumatary LJ, Das M, Goswami M, Kayal AK. Myopathies of endocrine disorders: A prospective clinical and biochemical study. Ann Indian Acad Neurol 2014;17:298-302. Duyff RF, Van den Bosch J, Laman DM, van Loon BJ, Linssen WH. Neuromuscular findings in thyroid dysfunction: A prospective clinical and electrodiagnsostic study. J Neurol Neurosurg Psychiatry 2000;68:750-5. Puvanendran, K, Cheah JS, Naganathan N, Wong PK. Thyrotoxic myopathy: A clinical and quantitative analytic electromyographic study. J Neurol Sci 1979;42:441-51. McElvaney GN, Wilcox PG, Fairbarn MS, Hilliam C, Wilkins GE, Pare PD, et al. Respiratory muscle weakness and dyspnea in thyrotoxic patients. Am Rev Respir Dis 1990;141:1221-7. DeMartino GN, Goldberg AL. Thyroid hormones control lysosomal enzyme activities in liver and skeletal muscle. Proc Natl Acad Sci U S A 1978;75:1369-73. Carter WJ, van der Weijden Benjamin WS, Faas FH. Effect of experimental hyperthyroidism on skeletal-muscle proteolysis. Biochem J 1981;194:685-90. Weissel M, Mayr N, Zeitlhofer J. Clinical significance of autoimmune thyroid disease in myasthenia gravis. Exp Clin Endocrinol Diabetes 2000;108:63-5. Verhagen WI, Schimsheimer RJ. Neurologic disease and thyrotoxic storm. A clinical and electrophysiological study. Electromyogr Clin Neurophysiol 1986;26:27-32. Nørrelund H, Hove KY, Brems-Dalgaard E, Jurik AG, Nielsen LP, Nielsen S, et al. Muscle mass and function in thyrotoxic patients before and during medical treatment. Clin Endocrinol (Oxf) 1999;51:693-9. Klein I, Ojamaa K. Thyroid (neuro) myopathy. Lancet 2000;356:614. Hirschberg K. Zur Kenntnis der Osteomalazie und Ostitis malacissans. Beitr Pathol 1889;6:513. Turken SA, Cafferty M, Silverberg SJ, De La Cruz L, Cimino C, Lange DJ, et al. Neuromuscular involvement in mild, asymptomatic primary hyperparathyroidism. Am J Med 1989;87:553-7.